Published by: Orion Children's Books. Official synopsis: "Thousands of years ago an orphan boy and his wolf cub companion challenge a demon bear that threatens to destroy their world forever. With the help of the World Spirit, Torak destroys the bear, but his beloved Wolf is lost in the ensuing avalanche. And Torak's quest is far from over. A strange, creeping sickness, silent and deadly, is threatening the Ravens. Word arrives that the Seal Clan have the cure and Torak must face a lonely journey to find it. On the Seal's Island he stumbles into a world utterly unlike his own. Here life moves to the rhythms of the sea, the Seals build shelters from whale bones and skim the waves in fast, beautiful kayaks. And here Torak is welcomed by the kindly Seal Mage, Teneris, and kinsman, Bale. But all is not as it seems - Torak must keep his wits about him to judge who might be friend or foe. As in 'Wolf Brother' Michelle Paver's sheer passion for her story set in a world of myth and natural magic, shines through in this skilfully woven, exciting and brilliantly satisfying second instalment of the Chronicles of Ancient Darkness. Dazzling entertainment, seamless storytelling - the second adventure in Torak's quest to vanquish the terrifying Soul-Eaters." 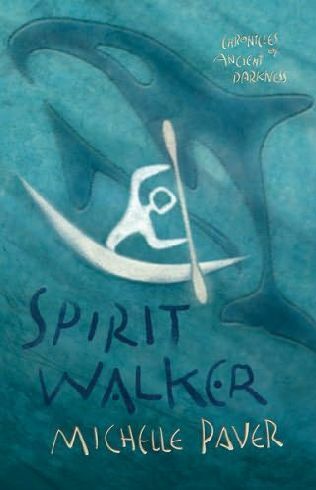 Spirit Walker is the second book in the Chronicles of Ancient Darkness and begins a few months after the end of Wolf Brother. Torak is living somewhat happily with the Raven Clan, but then people throughout the Forest begin to fall ill with a terrible illness. Rumors spread that the cure is by the sea, and Torak goes in search of it. This book takes the reader away from the pine-filled air of the Forest, and delivers the out into the open, crisp air of the Sea and the Seal Islands where Torak meets his kinsman, Bale, and the Seal Mage, Tenris. If you think that it cannot get any bigger after Wolf Brother then you are wrong wrong wrong! There's more action than you can shake a stick (or should that be spear?) at. Again the research is astronomical. The little elements just make you appreciate the scale of work involved for Michelle when she creates one of these amazing books. I love that in this one we get to see the orca's (killer whales to you and me) often referred to as hunters in the book. The fish, the different ways of catching and preparing prey/food. The skinboat. Everything about this book has a fresh feel to it. It makes for an amazing reading experience. Also in this book, Torak discovers his powers. Not going to say any more about that... but I will say it's not like a supernatural power! This book holds some importance to me. Physically. It was given to me by my nan, and was the last thing she gave me before she passed away. I can't help but think about her when I read it, so that just makes me love it even more. I love the cover art for this one. Blue is my favourite cover and it looks brilliant in the flesh. Just whatever you do, do not miss this series. I cannot stress how much you are missing out on if you do not read these books. I cannot get my love for them out enough! They are perfect reads. Announcing The Angel UK Blog Tour 2010! NEWS: Angel by L.A. Weatherly Trailer! Welcome To Roald Dahl Day!